My Favorite Things has a special "Campfire" challenge for Camp Create--dry embossing. I'm not sure if you could use embossing folders, because Stephanie Klauck demonstrated using a die. So I went ahead and used one of the "Flutter of Butterflies--Lace" dies from My Favorite Things & also a Spellbinders "Classic Ovals LG" die. I began by cutting a panel of white cardstock to 4.25x5.5". I marked the center of my panel, and used that to help me position my greeting, from MFT's "Birthday Greetings" stamp set. I stamped it in Lawn Fawn Guava ink, and positioned my oval die around it. I ran that through my die cutting machine with a silicone mat, to impress the oval into the cardstock. Then I removed the die, and used the butterfly die to make several impressions around the oval. Because I inadvertently ended up with an awkward empty space on my card panel, I created a "faux bow" with pink satin ribbon, following these instructions. That added a nice bit of dimension to my flat panel, and filled in that space perfectly! I decided I wanted a mat around my panel, so I trimmed off 1/8" from each side, to keep the greeting centered. Finally, I adhered my card front to a white A2 card base with foam tape. 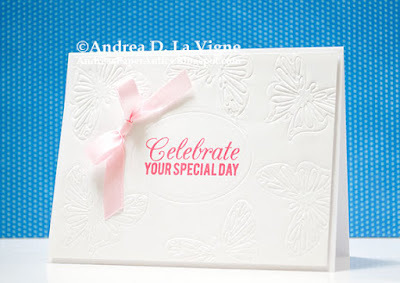 Simon Says Stamp's Wednesday Challenge: "Emboss It"
Very pretty CAS card, the subtle pink is just perfect. What a gorgeous card you have created using your dies in this manner! Creative thinking!! Thanks for joining our "Celebrations" challenge at Dies R Us! Simple and beautiful! Thanks so much for playing in our ‘Celebrations’ challenge at Dies R Us! Please come back again soon!